For some time, customers have been asking us for laser tracking solutions for challenging large part inspections. Since we were already providing similar inspection solutions using high precision 3D scanners and probing systems, we decided to expand our equipment and service offerings to include laser trackers. As many of you are aware, we recently announced our new partnership with Automated Precision Inc. (API). Not only did API invent the laser tracker, but API offers some of the most advanced laser trackers available today in terms of portability, ease of use, probing and accuracy. As an API authorized reseller, we are now able to offer advanced laser trackers to our customers who require high accuracy, fast and portable 3D measuring solutions for large part inspection, calibration, alignment and reverse engineering needs. For those of you who might not be as familiar with laser trackers as our other 3D scanning and 3D printing technologies, here’s a quick primer on laser trackers. A laser tracker is a very precise measurement tool for large or distant objects. 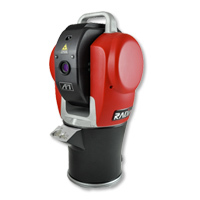 To put it simply, a laser tracker sends out a laser beam to a handheld round sphere (SMR) with mirror cut-outs that reflect the laser back to the main unit. A sensor in the tracker unit measures the distance to the SMR very accurately. Why is it called a laser tracker? Because the main unit head rotates and moves up and down to track the sphere held by the user. How accurate is a laser tracker? A laser tracker is accurate up to 5 microns per meter. For example at 30 feet that would be .00185 inches. That is an incredible accuracy for a non-contact measuring device. How far can a laser tracker measure? The API laser trackers can measure up to 100 meters in any direction. This means you could set the unit up in the middle of an object and measure up to a 200 meter diameter without moving the device. If you want to measure a larger area you would use a “leap frog” strategy to do so. What are the benefits of laser trackers versus traditional measurement methods? In addition to the laser tracker’s high precision and accuracy, laser trackers provide extremely fast single point measuring, as well as measure points continuously. This means data can be gathered on critical areas extremely quickly and accurately. What else does a laser tracker do? In addition to the SMR, API’s laser tracking system has a hand-held probing component. This is very important when you have line of sight issues to main unit or you are trying to measure inside a tight space in which an SMR does not fit. Are laser trackers used just for measuring? No, you can instruct the laser tracker to collect points as quickly as possible while you drag the SMR along a surface. This is great for objects that have a more complex shape to them. This data can then be used for reverse engineering applications. In addition to being an authorized API reseller, will EMS offer laser tracking services as part of its engineering services? Yes, EMS will be offering laser tracker services and sales. Feel free to give us a call at 813-971-2700 to discuss.